When industrial disasters make the headlines, we often sit up and take notice. Could it happen near me? Whether it strikes a gas and petroleum company, a chemicals warehouse or a fertilizer plant, first thoughts go to victims and communities’ understandable anger. When the dust settles, ensuing debate can result in positive change and sometimes increased understanding of the risks, and the costs of inaction to manage chemicals better. Perhaps more subtle, but equally harmful risks involve chemicals in the food we eat, the products we use, or the equipment we might mindlessly throw away. Around 100,000 chemical substances are found in products, or are on the market. It is estimated that by 2020, developing countries will produce and use 31% and 33% of global chemicals respectively. Chemicals are important for medicine and agriculture, for advancing technology and aiding economic growth: in 2013, world sales of chemicals were worth €3.2 trillion. But the chemicals challenge cuts both ways. If improperly managed, chemicals and the pollution linked with their manufacture, use, and disposal comes at a cost to the economy, human health and the environment. Occupational exposure to hazardous substances alone cause an estimated 651,000 known deaths annually, mostly in the developing world, a figure that may be greatly underestimated in some countries. And paint containing lead is still available especially in developing countries: childhood lead exposure is estimated to contribute to about 600,000 new cases of children with intellectual disabilities every year. The Strategic Approach to International Chemicals Management (SAICM) is a catalyst, connecting sectors and stakeholders towards the goal of a chemical-safe, clean and healthy future. As a voluntary platform comprised of more than 250 sectors and stakeholders, SAICM is unique, bridging these groups, and facilitating the exchange and collaboration that is necessary for chemicals management. SAICM has enabled actions beyond legal requirements, brought attention to, and furthered actions on emerging policy issues, supported projects worth more than US$110 million in more than 100 developing countries, and built networks across developing and developed regions. Sectors include agriculture, environment, health, business, labour, the private sector, science and academia. Stakeholders include governments, regional organizations, intergovernmental organizations, nongovernmental organizations, industry, consumers, farmers, transporters, producers, researchers, suppliers, waste and disposal handlers, and unions. The International Conference on Chemicals Management (ICCM) is SAICM’s governing body. ICCM works with stakeholders to assess progress towards implementation of the Strategic Approach, provides relevant guidance, promotes implementation of existing instruments, addresses policy issues, and seeks to meet technical and funding needs. At its fourth session (ICCM4) in Geneva, Switzerland, convening on 28 September-2 October 2015, work steps up on SAICM’s five emerging policy issues: lead in paint, endocrine disrupting chemicals (EDCs), chemicals in products (CiP), nanotechnology, and hazardous substances in the life cycle of electrical and electronic products (HSLEEP). Expecting over 800 representatives, ICCM4 will adopt decisions to support the international community in achieving the 2020 goal set by the World Summit on Sustainable Development to minimize health and environmental damage from unsound management of chemicals and waste. In particular, the future global development agenda – known as the post-2015 development agenda, or 2030 Agenda for Sustainable Development, will embrace all aspects of sustainable development and be guided by the Sustainable Development Goals (SDGs). Illegal International Trade – increasing efforts to track unrecorded trade in banned chemicals, counterfeit chemicals and hazardous waste. Every sector has a role to play. Responsible businesses have been showing that safe production and sound management of chemicals throughout their lifecycle, including using safer chemical alternatives in products, has altered nothing in the profit line nor damaged their brand but rather strengthened them. Leaders taking steps to share information, enforce legislation, and ban toxic chemicals deserve credit. 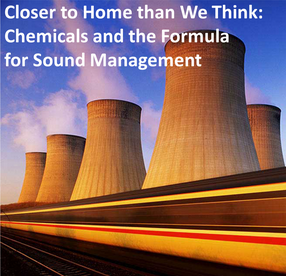 Everyone adding their voice takes the call for sound chemicals management up a notch – and takes us closer to that clean planet. We come in contact with chemicals every day. Let’s keep them clean. Let’s keep them safe.